Realistically postioned landmarks - scapulae and clavicles. 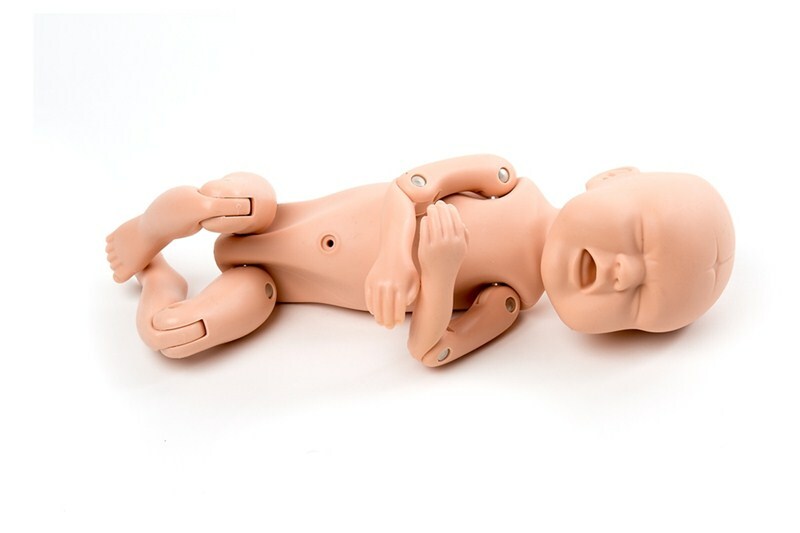 Arms and legs fully movable to allow all maneuvers required during deliveries - particularly breech and shoulder dystocia. Umbilicus and placenta (normal and retained). Fetal heart rate; normal, bradycardia and tachycardia (via software). Realistically modeled head with all head landmarks present (fontanelles and sutures). Head designed and tested so it can be used for forceps deliveries (rotational and “normal”), and suction delivery (Kiwi and Ventouse). Head can be easily manipulated and flexes naturally as it is pushed through the birth canal. Mouth for suction and Smellie-Veit (if required). Body “streamlined” to allow it to be easily pushed through birth canal. Bony prominences of the hips to support Lovset`s maneuvers.